At New Leaf, we understand how mephedrone addiction can take over your life. We will tailor our innovative mephedrone addiction treatment programme to address your needs and help you get your life back on track. Your individualised drug rehab program would include detox, individual therapy, group therapy, family therapy and a wide array of other treatment services designed to ensure you receive the highest standard of mephedrone addiction treatment and achieve sustained recovery. Mephedrone (sometimes called “meow meow”) is a powerful stimulant and is part of a group of drugs that are closely related to the amphetamines, like speed and ecstasy. There isn’t much evidence about mephedrone and its long term effects as its quite a new drug but because it is similar to speed and ecstasy the long term effects may well be similar. There have reports of people hospitalised due to the short-term effects. Also, you can never be entirely sure that what you’re buying is actually mephedrone and not something else. Euphoria, alertness, and feeling of affection towards the people around you. Feelings of anxiety and paranoia. Mephedrone, or meow meow, can also overstimulate your heart and circulation and can overstimulate your nervous system, with risks of fits. There have been reports that more people are injecting mephedrone. Injecting any drug, or sharing injecting equipment, runs the risk of the person injecting catching or spreading a virus such as hepatitis C or HIV. There is also the risks that veins may be damaged and that an abscess or a blood clot will develop, leading to further damage, such as gangrene. Mephedrone is often described as a mix between amphetamines, ecstasy, and cocaine. The effects of mephedrone last for about an hour, but the following can vary. It can make you feel alert, confident, talkative and euphoric- and some people will temporarily feel strong affection to those around them. Mephedrone can make users feel sick, paranoid and anxious, and it can cause vomiting and headaches. It also risks overstimulating your nervous system, which may cause hallucinations, feeling of agitation and even fits. Other effects that people have reported include heart palpitations, insomnia, loss of short-term memory, vertigo (a form of dizziness), grinding of teeth, sweating and uncomfortable changes in body temperature. Users have reported blue or cold fingers- this is probably because mephedrone affects the heart and the circulation. Some users have six deaths involving mephedrone reported in 2011 in England and Wales. Some users have also had severe nosebleeds after snorting mephedrone. Overheating has been a significant cause of deaths when other amphetamine-type drugs, such as ecstasy, have been used along with mephedrone. Injecting mephedrone is particularly dangerous. it’s much easier to overdose when injecting. Research suggests that on average mephedrone is 50% pure, so it’s not just the mephedrone that goes into your bloodstream. Injecting can also cause damage to veins and arteries, and may cause ulcers and even gangrene (that’s when bits of the body start to die). Viral hepatitis and HIV/AIDS infections can be spread by users sharing needles, syringes or other injecting equipment. You increase the risks to yourself if you combine alcohol with mephedrone or any other drug that causes a ‘high’ – including increasing the risks of death. 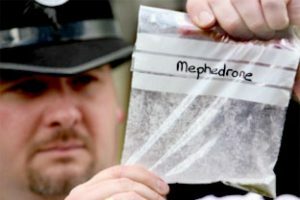 Mephedrone is a class B drug-so it’s illegal to have for yourself, give away or sell. Supplying someone else, even your friend, can get you fourteen years in jail and/or an unlimited fine. If the police catch you with mephedrone, they’ll always take some action. This could include a formal caution, arrest and prosecution. A conviction for a drug-related offence could have a serious impact. It can stop you from visiting certain countries- for example, the United States- and limit the types of jobs you can apply for. Like, drink driving, driving when high is illegal and you can still be unfit to drive the day after using mephedrone. You can get a heavy fine, be disqualified from driving or even go to prison as a result of this. If after reading this you are concerned that a friend, family member or yourself is struggling with a mephedrone addiction, contact us on 0300 999 0330 today.